The evolutionary processes of mutation, migration, genetic drift, and natural selection shape patterns of genetic variation among individuals, populations, and species, and they can do so differentially across genomes. The field of population genomics provides a comprehensive genome-scale view of these processes, even beyond traditional model organisms. Until recently, genome-wide studies of genetic variation have been prohibitively expensive. However, next-generation sequencing (NGS) technologies are revolutionizing the field of population genomics, allowing for genetic analysis at scales not previously possible even in organisms for which few genomic resources presently exist. To speed this revolution in evolutionary genetics, we and colleagues developed Restriction site Associated DNA (RAD) sequencing, a method that uses Illumina NGS to simultaneously type and score tens to hundreds of thousands of single nucleotide polymorphism (SNP) markers in hundreds of individuals for minimal investment of resources. The core molecular protocol is described elsewhere in this volume, which can be modified to suit a diversity of evolutionary genetic questions. 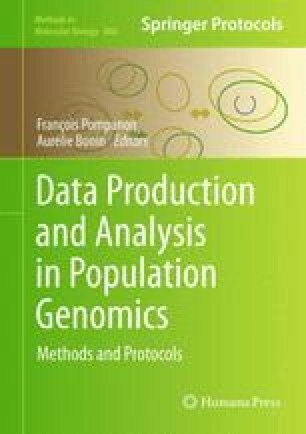 In this chapter, we outline the conceptual framework of population genomics, relate genomic patterns of variation to evolutionary processes, and discuss how RAD sequencing can be used to study population genomics. In addition, we discuss bioinformatic considerations that arise from unique aspects of NGS data as compared to traditional marker based approaches, and we outline some general analytical approaches for RAD-seq and similar data, including a computational pipeline that we developed called Stacks. This software can be used for the analysis of RAD-seq data in organisms with and without a reference genome. Nonetheless, the development of analytical tools remains in its infancy, and further work is needed to fully quantify sampling variance and biases in these data types. As data-gathering technology continues to advance, our ability to understand genomic evolution in natural populations will be limited more by conceptual and analytical weaknesses than by the amount of molecular data. We thank members of the Cresko and Johnson laboratories, and numerous other University of Oregon researchers, for discussions about the use of NGS data for population genomic studies. This work has been generously supported by research grants from the US National Institutes of Health (1R24GM079486-01A1, F32GM076995 and F32GM095213) and the US National Science Foundation (IOS-0642264, IOS-0843392 and DEB-0919090).